Berlin School electronic music in the style of Klaus Schulze late 2000 or Indra. The sound which goes out is the one of a saxophone. The ears riveted to the headphone, we even hear the breaths of the saxophonist. When Ron Boots speaks, EM fans have generally the attentive ears. 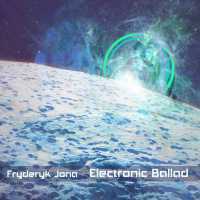 When he mentions that “Electronic Ballad” is an album to be listened to, that Fryderyk Jona is an artist to discover, the curiosity is fast spurred. And I start searching. I received the music of this Polish synthesist who lives now in Germany and of which the style is influenced by an ambient and a melancholic Berlin School. The presentation is very well made with a beautiful artwork, the album is only offered in a CD digipack version for the moment, of an astral blue which encircles an image of the cosmos. And the first sound which goes out is the one of a saxophone. At the beginning, we are not certain. It sounds like Klaus Schulze's In Blue. Remember this synth perfumed of a saxophonist's harmonies. It's the first impression that comes to us. And afterward? We fall in the delight! A slow and wide synth line comes to give more luster to this saxophone, plunging the long eponym track into an ambient serenade where the synth subdivides its songs with clouds of mist and layers of faded voices. Another synth line draws some electronic scrawls which make slow twists in a sound mirage which plunges us at full into the atmospheres of Into the Blue. Sequences tinkle in background. Their ringings get more and more persistent while a line of bass and fine percussions are drumming the first structure of rhythm of this long sonic river of 35 minutes. The percussions and the bass weave a kind of slow cosmic Groove where everything is soft, where everything is very ethereal. An electronic nightingale presents us funny songs which go and come in this ballet for carillons and percussions where the heat of tones, and its contrasts, guides us towards a waking dream. The synth layers perfume the background decoration of an anesthetic mi st, leaving to the saxophone the care of throwing us its harmonies for weakened souls. The progression is slow. Structured always on a soft, hardly ambient rhythm, it remains a prisoner of this very beautiful carousel of carillons where the glass arpeggios are tinkling in random way and where other elements of split up rhythms feed a hardly chaotic sweetness. And always these songs of nightingales. And always these perfumes of saxophone which embalm a solitude supported by layers of astral choirs. This soft rhythm takes another tangent towards half-time with more accentuated leaping, or chirping according to our perception, which get lost in a long sizzling humming. "Electronic Ballad" dives then into a kind of down-tempo fed by bass pulsations which skip and which beat a measure without precise pattern and where are patrolling serpentines of sequences. The last eight minutes bring "Electronic Ballad" towards a very ambiospherical phase where we re-hear more clearly these undulated waves which structured its wall of atmospheres since the very beginning, while that e-tortillons and long hummings gain their rights over this wonderful duel between synth and saxophone. "Orient Voice" is more lively and respects this pattern of duel between the synth and the saxophone, while adding to it a voice of East. The rhythm extricates itself with difficulty from the nothingness with loops of sequences which describe small repetitive circles and draw a spherical ambient rhythm with nuances in tones and in the shape. These two lines of rhythm mix their minimalist approaches in a finely jerky structure which stuffs itself with bass pulsations, with jingles of cymbals and with percussions which machine-gun after all a very good moment of cosmic Groove. There also, the tone and the ambiences are hardly inseparable from Klaus Schulze's In Blue album with a bit of Dig it. It's very good and there is quite a work at the level of the mixing because every element which sculpts the tempo, and there are a lot, is clearly recognizable. As well as these multi-layers of synth which bicker the atmospheres and the harmonies with this delicate oriental voice and this saxophone which we can easily confuse for a synth. Lines of synth are dancing in the firmament of atmospheres which leads "One the Run" to our ears. They draw lively undulated waves to which is grafted a line of sequences fed by rhythmic chirping. Here, as everywhere around the 50 minutes of “Electronic Ballad”, the rhythm is forged with an attention to details which is outstanding. Fryderyk Jona weaves two lines of sequences, one a very organic tone and the other one very electronic, which intertwine their jumping keys in a pattern of rhythm made by loops and fed by the skipping of a bass line and bass pulsations as well as jingles of percussions and percussions a bit hip-hop pecked by tsitt-tsitt of cymbals. The result is a kind of Funk and Groove very electronic with synth lines weavers of undulatory harmonies and of electronic dialects. That does very contemporary Schulze! Ron Boots was right! Fryderyk Jona is an artist to discover. It's difficult to classify “Electronic Ballad” so much the genre is far enough from what we are used to hear. To me it's electronic serenades! The music, the atmospheres are charming and the minimalist rhythms are constantly shaded by some very tight knitting of sequences lines. And the suppleness of the percussions as well as the bass pulsations and the bass open the doors of an Electronica rocked by raids of Jazz. There is a lot of Schulze influences here. But what holds attention is this unique signature where the universe of Fryderyk Jona will park definitively its imprints in the ears of those who want to explore a Berlin School clearly more contemporary. Great...A must have!